"The view is taken from the high grounds of Balmain, overlooking Parramatta River, near the road which has been recently cut through the bush to Sydney, round the head of Darling Harbour, and not far distant from Birch Grove, the delightful seat of Captain M'Lean, Principal Superintendent of Hyde Park Barracks ... 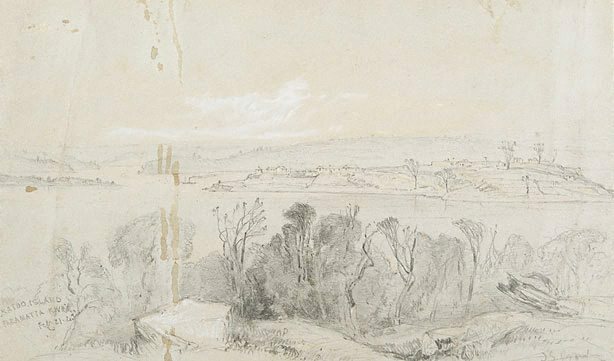 In the foreground of the picture, we have a specimen of the bush scenery that prevails along the banks of the Parramatta River and Port Jackson". Signed l.r. corner, pencil "J.S. Prout". Dated dated l.l. corner "... Feb 21.43". Hendrik Kolenberg, 19th century Australian watercolours, drawing and pastels from the Gallery's collection , 'Introduction', pg. 6-16, Sydney, 2005, 9, 38 (colour illus. ).